Highest Converting Capture Pages I Have Ever Used. Make More Profit! Optimized loading times. Especially if you use shared hosting (which most of us do) you will never be able to match page loading times of a dedicated server. 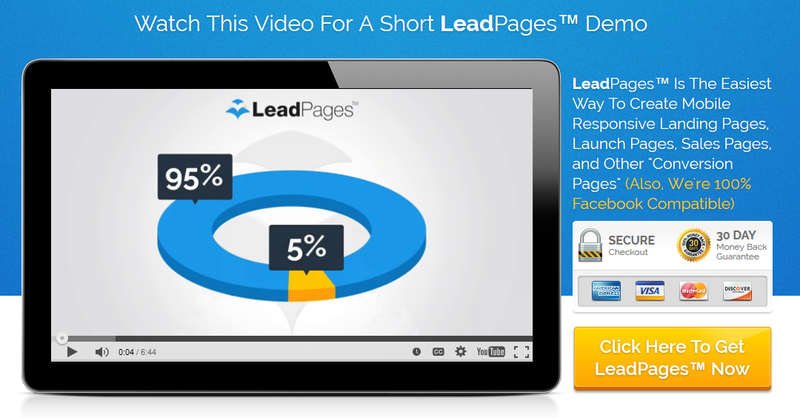 Leadpages loads faster than any other platform I’ve ever seen. It’s a proven fact, that when people click a link and it doesn’t load fast enough, they will leave before every seeing your offer. The customizable templates are amazingly simple. You literally need no coding experience to make professional looking capture pages. They offer low monthly or annual payment plans. They offer a very lucrative affiliate program if you would like to earn income with the #1 capture page provider on the net. I know people making 6 figures per month who use LeadPages.net for all their capture/landing page needs; it just works. They offer free services such as digital asset delivery. I.e., if you want to give away a free product with your opt ins, you can do that by uploading the file to leadpages and letting them send it out. Without this you would have to create a separate mailing list for each offer. This is a huge time saver. A WordPress plugin that allows easy integration with wordpress: you can create normal pages, home pages, welcome gates, and 404 redirects. The wordpress welcome gate is phenomenal. I have seen a sharp increase in the number of visitor conversions since implementing. If you went to my root domain (http://southernprofit.com) for the very first time, you would see what is known as a welcome gate, as seen below. If you don’t see it, you can change browsers or clear your cookies and then revisit http://southernprofit.com/ and it will show up next time. This is basically a capture page which loads the first time a person visits your website. It only loads if the person enters via the root domain though. And it only shows up once per year per browser (it will also show up again if you clear your cookies).Any other time, that person visits your site, they will get the home page as seen below. This technology is extremely effective at capturing emails and building your list. It is replacing many of the, often, annoying popups and light-boxes many of us have used in the past.To get LeadPages or to find out more information, clicke the two images below to get a good taste of what LeadPages can do for you bank account! For more great tips on making money online and increasing your web presence, don’t forget to join my mailing list!